MRL strain mice discovered accidentally at the Wistar Institute in Pennsylvania are apparently able to regrow limbs as well as organs, including the heart, liver and brain. The ability to regrow parts of the body have been found in other animals (like salamanders), but never in mammals. Even better, cells from the regenerative mice were injected into normal mice, the normal mice adopted the ability to regenerate. And when the special mice bred with normal mice, their offspring inherited souped-up regeneration capabilities. 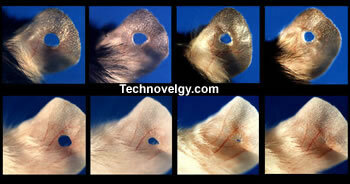 In the picture shown above, normal mice have holes cut in their ears; the top row of pictures shows the healing process. The bottom row of pictures show how the MRL strain mice heal completely without a scar from an identical wound. Hirald gazed at him very directly. "How is your hand?" Snow looked down at the stump. He unclipped the covering and pulled it off. What he exposed was recognizably a hand, though deformed and almost useless. The covering had been cleverly made to conceal it, to make it appear that the hand was missing. Read more about Mighty Mice Regrow Organs; thanks to Adi for the tip on the story and the related sf work.